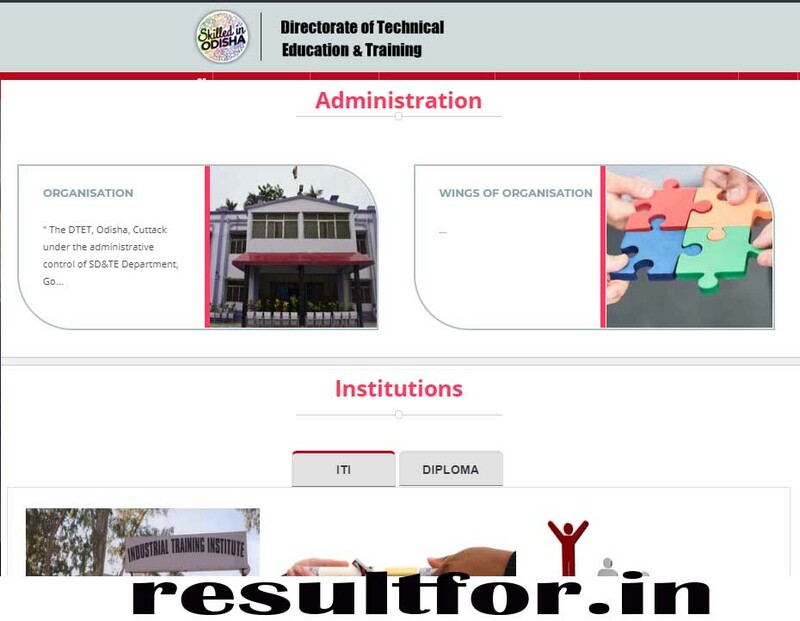 Directorate of Technical Education & Training, Odisha conduct Odisha Polytechnic Entrance for taking admission in technical professional courses. Odisha Polytechnic Entrance Test is a state level entrance conducted for offering admission in various polytechnic colleges institutions and colleges of Odisha for Engineering courses such as Mechanical, Civil, Electronics & Communication, Diploma in Engineering (Lateral Entry), Diploma in Non-Engineering, Diploma in Film/TV etc. Admission offered by polytechnic colleges in various diploma courses in the first year as well as the second year (Third Semester) through lateral entry. Odisha Polytechnic Exam is a popular state level entrance in Odisha who wants to take part in diploma courses for various courses. It is expected from aspirants to know all the details related to Odisha Polytechnic 2019Exam. There will be No Polytechnic Entrance Exam for offering admissions in diploma courses. Admission will be done through merit list which will be prepared on the basis of marks obtained by candidates in 10th Standard. Candidates are requested to read further to know all the details of Odisha Polytechnic 2019such as Odisha Polytechnic Application form, Odisha Polytechnic Eligibility, Odisha Polytechnic Admission Procedure etc. Odisha Polytechnic 2019 Exam be held for taking admission in various polytechnic college for diploma courses in the first & second year (Lateral Entry) of engineering & Non- Engineering Courses. All those who want to appear for Odisha Polytechnic 2019 Exam must meet the eligibility criteria. Please note: There will be No Odisha Polytechnic Exam for taking admission in the first year & Second year of Diploma courses. Directorate of Technical Education & Training, Odisha conduct the Odisha Polytechnic Exam. Candidates will have to check the eligibility criteria before filling up the Odisha Polytechnic 2019Exam. Please read further to know all the details of the Odisha Polytechnic Exam such as Offered Courses, Eligibility Criteria for Odisha Polytechnic Exam, Age etc. All the candidates should be the permanent resident of Odisha state. Those who have completed their 10th or 12th Board from outside Odisha state can also if they are the permanent resident of Odisha state. Candidate must have completed 10th Board (SSC) or equivalent from any state recognized educational board having Mathematics, English & Science as their qualifying subjects. Candidates must have secured at least 35% Marks in aggregate and minimum of 30% Marks in each qualifying subjects. The minimum age limit is 14 years except for courses such as Drilling & Mining. For Drilling & Mining courses, minimum age is 16 years. Candidates must have completed 12th Board (HSC) or equivalent from state recognized educational board such as Council of Higher Secondary Education Odisha, having Chemistry, Physics, & Mathematics (PCM) as their qualifying subjects. Candidates who want to take admission through lateral entry must have obtained the minimum of 35% Marks in 10th Board are also eligible. Candidate must be a minimum of 14 years. Candidate must have completed 12th Board (HSC) or equivalent from recognized educational Board such as Council of Higher Secondary Education, Odisha. Eligible candidates must have obtained the aggregate of minimum 35% marks with having at least 30% Marks in each qualifying subjects. Candidate must have secured at least 35% marks in aggregate in Physics, Mathematics, & Chemistry in 12th Board for beauty culture course. If the candidate, have passed 10th Board then it must have secured 35% Marks in aggregate having Mathematics, Science & English as their qualifying subjects. Candidate must be a minimum of 16 years for courses such as Hotel Management & Catering & Modern Office Management. 14 years, the minimum age required for Beauty Culture. Directorate of Technical Education & Training, Odisha conduct Odisha Polytechnic Exam also known as Diploma Entrance Test (DET) to offer admission to various diploma courses in the first year as well as the Second year (Lateral Entry). Various Government, Self-financed and Govt. Sponsored colleges/ institutions consider Odisha Polytechnic Entrance Exam for offering admission to diploma courses in the field of Engineering, Diploma in Engineering (Lateral Entry), Diploma in Non-Engineering, Diploma in Film/TV etc. There will be the lateral entry for taking admission in the second year (Third Semester) of diploma courses. All those students who want to take admission in diploma courses in the various Polytechnic institution or colleges of Odisha must fill up the Odisha Polytechnic 2019 Application Form. From 2019, It has been decided that There will be No Odisha Polytechnic Entrance Exam. Candidate will get admission to various Diploma courses on the basis of 10th Marks secured by candidates. We have covered every detail about Odisha Polytechnic 2019Application form such as How to fill the Odisha Polytechnic 2019 Application form, Closing date to fill Odisha Polytechnic 2019 Exam, Odisha Polytechnic Counselling, etc. Odisha Polytechnic 2019 Application Form will start for filling up from the fourth week of April 2018. Odisha Polytechnic 2019 Application Form will be available in Online mode only. Interested candidates who want to fill the Odisha Polytechnic 2019 Application form must meet the eligibility criteria. Please read the Odisha Polytechnic Information Brochure before filling up the Odisha Polytechnic 2019 Application Form. All the candidates will have to complete the application process on or before the last week of May 2018. Submit the duly filled the Odisha Polytechnic 2019 Application Form. Odisha Polytechnic 2019 Application Form payment can be done Online by Debit/Credit Card, NetBanking at any branch of Axis Bank / IDBI Bank. Those who want to make payment offline can be done through e-Challan at any Branches of Axis Bank/ IDBI Bank. Odisha Polytechnic 2019 Application Form will be provided Online only. There will not be the availability of Odisha Polytechnic 2019 Application Form offline. Candidates shall read Odisha Polytechnic Information Brochure carefully before filling up the Odisha 2019 Application Form. Odisha 2019 Application Form cannot be accepted without payment of application fee. Now, Click on New Registration Button. Read instructions before clicking on the “proceed” button. Fill out all the personal and communication details such as Name, Date of Birth etc. Finally, make the payment by using either Offline or Online mode. Please take few printouts of completely filled Odisha Polytechnic 2019Application Form for future reference. Odisha Polytechnic 2019 Exam result which will be conducted by Directorate of Technical Education & Training, Odisha will declare the Odisha Polytechnic 2019 Result in the month June 2019 on the official portal. Odisha Polytechnic 2019 Result will get declared after the document verification process for eligible candidates filled up the Odisha Polytechnic 2019 Application Form. Those candidates, qualify for the Odisha Polytechnic 2019 Exam and shortlisted in the Merit List will be eligible for taking admission in the diploma courses in the first year of engineering, Pharmacy etc. Please read further to know more about the Odisha Polytechnic 2019 Result such as how to check the Odisha Polytechnic 2019 Result, Odisha Polytechnic 2019 Merit List, Odisha Polytechnic 2019 Score Card etc. Clicking on the search result button. Now, enter Application No., Date of Birth and Name of the Parents. Candidate can check their result as marks obtained in the Odisha Polytechnic 2019 Exam. There will not be any such provision for sending individual Score Card or Odisha Polytechnic 2019 Result to any Candidates by Post. Odisha Polytechnic Exam Authority will not entertain any requests made pertaining to re-evaluation or checking of Exam. There will be a separate declaration of Odisha Polytechnic 2019 Result for Non-Engineering & Engineering courses. Those candidates who will be shortlisted for merit list will be called for Counselling process for the first semester & third semester (through lateral entry). Download Result For App for all latest update about the Polytechnic and other admission related update. Having any query then you can ask through the comment.